The expansion into service on the US mainland for Hawaiian Airlines continues at a pace with the introduction of two more brand new Airbus A321neos aircraft. The sunny carrier recently took delivery of its fifth and sixth A321neos, which are scheduled to enter service a little later this month, after some crew familiarisation work. Hawaiian says that it will deploy the remaining aircraft of its 18 A321neos on order, on flights between Hawaii and the US mainland as well as secondary routes on the US mainland. The carrier currently operates its A321neos on four routes, from both Honolulu and Maui to Portland, Oregon; from Maui to San Diego; and from Honolulu to Oakland. The next scheduled destination for one of the new A321neos will be Oakland from Lihu’e from 16th July. Begining in April next year the flight will depart Maui at 1245 arriving in Sacramento 2055 before the return is scheduled to leave at 0830 in the morning, landing in Maui at 11.15 The highly efficient, mid-range A321neo aircraft complement Hawaiian’s fleet of wide-body aircraft currently used for service between Hawai‘i and 12 U.S. gateway cities, along with 10 international destinations. 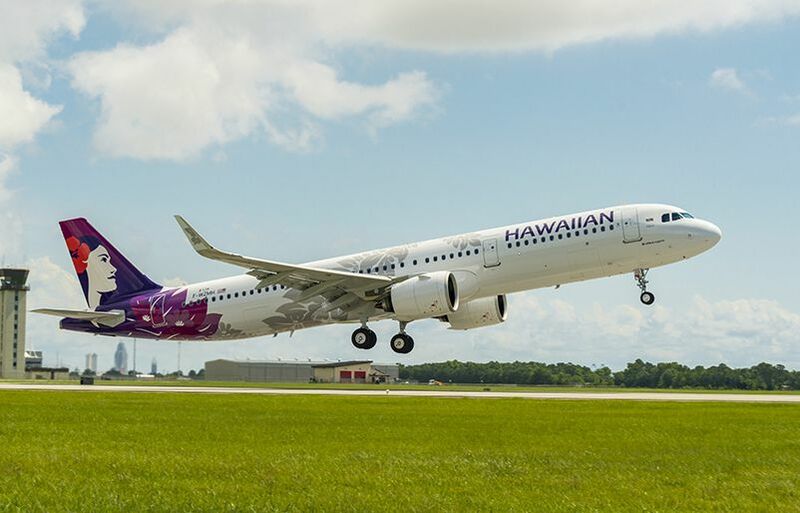 Hawaiian’s 189-passenger A321neo includes 16 luxurious leather recliners in First Class, 44 Extra Comfort premium economy seats, and 129 Economy seats. The aircraft also have WiFi streaming in-flight entertainment and USB points and larger overhead luggage compartments.